Nursing is one of the most popular majors with 165,168 graduates per year! Perhaps the $53,333 average early career salary has something to do with this major's appeal. The average Nursing graduate earns 6.0% more than other college graduates.You can boost your earning potential by graduating from one of the top schools in our rankings. Check out the schools below and see in what other categories they are considered the best. You can find rankings of Nursing programs with the highest starting salaries below. 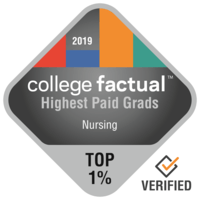 Our ranking methodology uses Nursing specific starting and mid-career salaries of graduates from each college to generate a list of the best. Columbia University in the City of New York is the top choice if you're interested in a degree in Nursing. Students who graduate from the Nursing program make about $68,780 in their early career salary and $97,699 in their mid-career salary. New York, New York is an ideal environment for individuals who enjoy the fast moving urban lifestyle. About 44.0% of students submit ACT scores, with the standard score being in the 34 range. This school has a low crime rate, among the safest in the U.S.. Get an idea of what student life at Columbia is like by viewing some campus videos. California State University - Sacramento is a wonderful choice for students pursuing a Nursing degree. Nursing majors from California State University - Sacramento earn a boost of around 34.4% over the typical income of nursing majors. The location in a major city is wonderful for students looking for enough possibilities for networking, adventure, and discovery. This school is thought to be a good choice for veterans. This school's affordable net price is quite attractive to cost-conscious applicants. Get all the essential details on California State University - Sacramento by checking out their scorecard. Georgetown University is among your best bets if you're planning on studying Nursing. Nursing graduates from Georgetown University receive an earnings boost of about 34.3% above the average earnings of nursing graduates. The surrounding area of a large city is wonderful for young people trying to find adequate choices for social networking, excitement, and discovery. There is an advanced degree program obtainable for students who are intrigued. You'll be able to meet others from a lot of nationalities because of Georgetown's diverse student body. Where is Georgetown University doing the best? Look into all the college rankings. It's hard to find a better school than San Francisco State University if you wish to study Nursing. San Francisco State University nursing students earn 30.7% more than the average nursing grad. With more than 20,000 undergraduates, San Francisco State University is one of the largest schools in the nation. This school does not require freshman students to live on-campus. 60.0% of undergraduates at this school get educational funding, so be sure to complete the FAFSA! For additional information, look at college scorecard. Any student who is interested in Nursing has to look into Molloy College. Soon after getting their bachelor's degree, Nursing students usually make about $70,305 in their early careers. Situated in Rockville Centre, New York, Molloy supplies a safe and sound, suburban atmosphere for young people. If you are interested in Molloy, hit the books. The usual SAT score of applicants is 1,075. 85.0% of first-year students come back for their second year of school. Videos from Molloy could be a good way to explore college. Mount Saint Mary's University is one of the finest schools in the U.S. for Nursing. Students who graduate from the Nursing program earn about $73,248 in their early career salary and $86,277 in their mid-career salary. Los Angeles, California is an ideal area for students who enjoy the active urban lifestyle. Since 3.7% of MSMU's student body is from outside California, you are going to have a lot of opportunities to meet undergraduates from all over the country. This school offers advanced degree programs for students who want to carry on after earning a bachelor's degree. See all of Mount Saint Mary's University's rankings to learn more about the college. Any student who is interested in Nursing needs to take a look at California State University - East Bay. Graduates of the nursing program state that they receive average early career income of nursing and mid-career income of $92,367. Located in Hayward, California, this institution is a logical option for students who enjoy the thrills of a substantial city. California State University - East Bay has earned a top rating for quality of education for veterans and military personnel. This institution is a great value for students in California. The scorecard will give you a good review of California State University - East Bay. California State University - San Bernardino is a great option for individuals interested in a Nursing major. Nursing students from California State University - San Bernardino earn a boost of about 26.3% above the average earnings of nursing graduates. Based in San Bernardino, California, this school is a logical choice for students who enjoy the buzz of a significant city. About 50.0% of the professors at California State University - San Bernardino are full-time and get normal office hours, so they tend to be more accessible to help. California State University - San Bernardino offers graduate degree programs for those who need to keep going after achieving a four-year degree. In what areas is Cal State San Bernardino doing the best? Take a look at all the school rankings. Every student who is interested in Nursing needs to take a look at George Washington University. Students who graduate from the Nursing program earn about $64,249 in the first five years of their career and $91,583 after their first five years of their career. Want a sizable student body? This institution has over 20,000 students on campus. Because of its affordable net price and excellent instructional programs, George Washington University is a good value, attaining a position of #3 in District of Columbia. This school is thought to be a great decision for veterans. Get an idea of what being on campus at GWU is really like by seeing a few campus videos. Adelphi University is a great option for students pursuing a Nursing degree. Nursing students from Adelphi University earn a boost of about 26.1% over the average earnings of nursing majors. The destination of Garden City, New York, is great for students who favor a more tranquil, suburban spot. Adelphi's women's basketball team is a powerhouse you are sure to enjoy cheering on. This school does not require freshman students to live on-campus. Where is Adelphi really succeeding? Take a look at all of the school rankings.